Sergio Garcia poses for a portrait in Chico, Calif., on April 2. 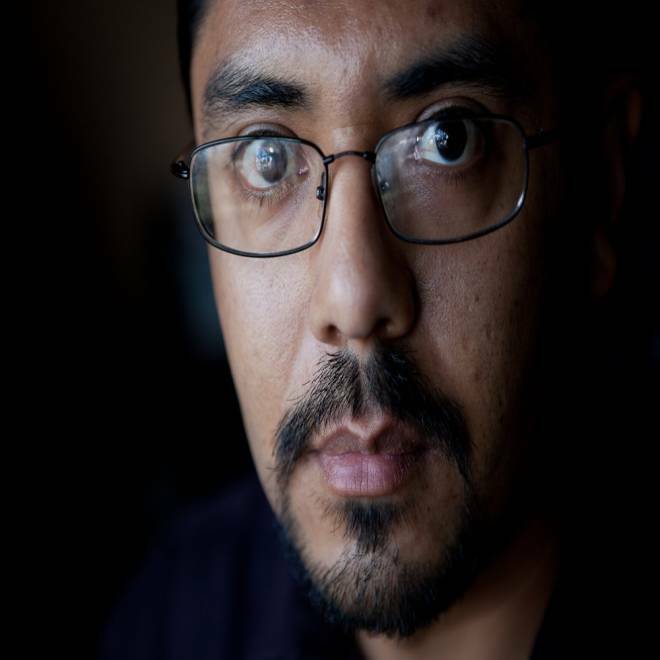 Though he earned a law degree and has passed the state bar exam, Garcia, an undocumented immigrant, is not allowed by the state to practice law. He's spent most of his life trying to gain citizenship. This article, the third in a series on the paths to citizenship, is part of NBC News’ special report “Immigration Nation,” an in-depth examination of immigration in America. For Sergio Garcia, the magic number is 25. That's how many years he will have waited for his green card if, as he estimates, he gets it in 2019. Garcia, 36, is one of millions of immigrants seeking a green card, or legal permanent residency in the U.S., which he has called home for most of his life. His dad, a naturalized citizen from Mexico, sponsored him, and he was approved to begin the naturalization process in 1995 at age 17. But like many other applicants, Garcia has to wait for a green card to become available since quotas limit the number given out annually. Authorities first told him it would take three to five years to reach his “priority date” – when he could start the five-year process of getting a green card. 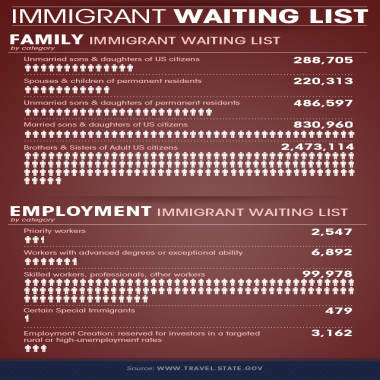 As Congress prepares to unveil its long-awaited immigration reform, many would-be immigrants are hoping it provides a viable legal way for them to join their families in the U.S., with reasonable wait times they feel will discourage unlawful immigration. 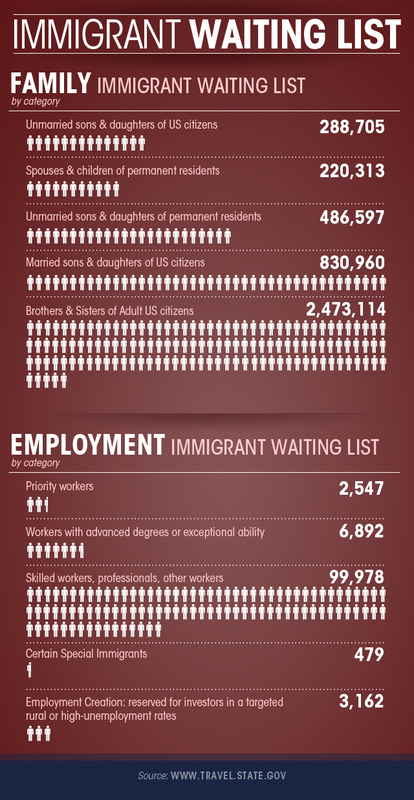 Why is it so important to become a U.S. citizen? At recent swearing in ceremonies in Los Angeles, we asked our newest citizens that question. The U.S. immigration system was refashioned in the mid-1960s to focus on family unification, though critics say it has hardly lived up to that ideal. 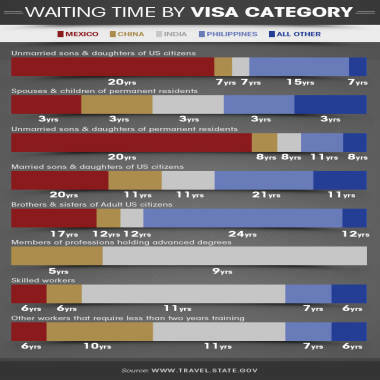 Now, applications for family-sponsored green cards represent the vast majority of requests for legal permanent U.S. residency: 4.3 million of the roughly 4.4 million applications on the waiting list as of November came from parents, adult/minor children, adult siblings or married couples, according to the State Department. The previous national-origins-based system was “very discriminatory” in prioritizing Europeans over Asians and Latin Americans, said Doris Meissner, commissioner of the Immigration and Naturalization Service from 1993 to 2000. But lengthy lines built up for countries with high numbers of applicants, such as Mexico, the Philippines, India and China, said Meissner, now head of the Migration Policy Institute’s U.S. immigration policy program. Some advocates of stricter immigration controls think these lines shouldn’t exist at all, saying family-sponsored green cards should only go to the minor children and spouses of U.S. citizens. There is “no good answer” to cases like Garcia’s, he added. Garcia's story is in many ways typical of undocumented immigrant residents treading the family path to a green card, lawyers and experts say. His father had a green card but was not yet a U.S. citizen when he applied for his son, putting Garcia in a lower-priority category even though he was under 21 – the age when minor children become adults under U.S. immigration rules. His dad became a citizen in 1999, which would have put Garcia on the fast track as the child of a U.S. citizen had he not turned 21 the previous year. Instead, he entered another line: unmarried adult children of U.S. citizens. Immigration is today handling those cases from Mexico dating to Aug. 1, 1993. In the meantime, Garcia said, he has lost college financial aid and job offers because he is undocumented. He said he would have probably returned to Mexico if he had known it would take so long. Even for those on a seemingly smoother path, such as a foreigner marrying a U.S. citizen, the family route still can take years. Jeanette Smith, a former immigration lawyer in Miami who once guided couples through the system, is at the next step in the process as she tries to win citizenship for her husband, Agustin Gonzalez, a Panamanian national: providing documentation and going through interviews with immigration officials. Applicants have to provide a dossier that includes the results of a medical exam, an affidavit of support from the relative sponsor saying the applicant has sufficient means of financial support and is unlikely to become a public charge, and any military, court and prison records, plus original documents establishing family ties between the sponsor and the applicant. Many applicants must do interviews with U.S. consular or embassy officials in their home country. Married in 2009, Smith and Gonzalez, 41, have had two interviews with immigration officials and have submitted documents such as wills, powers of attorney and three years of joint tax returns. 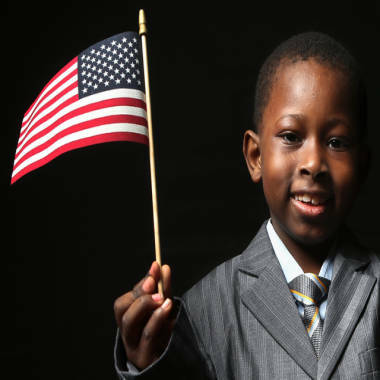 After migrating to the U.S. as minors, children take their oath of allegiance to become citizens. The couple provided a wedding album, and affidavits from friends and co-workers attesting to their relationship, too. But Gonzalez, who first came to the U.S. on a guest worker visa that expired, remains undocumented. Since the couple was married less than two years during their first immigration interview in 2009, he could only get a conditional green card that expired in January while they were awaiting the second interview, said Smith, 47, executive director of South Florida Interfaith Worker Justice. It leaves Smith feeling scared that her husband could be deported, although judges can exercise discretion. Some who make it through the process can still in the end be denied a green card for dozens of different reasons, said Muzaffar Chishti, director of the Migration Policy Institute's office at New York University School of Law. “This is an amazing story in people’s resilience at some level and it continues to show you how much appeal the U.S. green card still holds, that people are willing to put their lives on hold for prolonged periods of time,” he said. Sergio Garcia helps Alma Garcia obtain a legal work permit at his office in Chico, Calif., on April 2. Garcia has forged ahead despite the barriers. He graduated college and law school, and is leading a landmark case in California that could set a national precedent on whether undocumented immigrants can receive law licenses. In the meantime, he works as an independent legal aide. He ultimately believes the wait will have been worth it. Follow Miranda Leitsinger on Twitter and Facebook.